We have all heard of work-life balance. It’s supposed to all work out: you have your job, a hobby, time for family and friends. Only very rarely does it work out that way. In Spain, work-life balance is prioritized even more than I am used to in America. At work we are strongly encouraged to take a break to eat lunch (unheard of when I was working in the states). If I stay late, people ask why, as though working extra hours is unheard of. Eating out, either for dinner or lunch, takes at least an hour, if not two and isn’t meant to be rushed through. Dining is as much an art form as is cooking is in France. This concept of enjoying life that I love so much about Spain also means my social gatherings tend to turn into three or four hour events. So how do you prioritize work with life when you’re a creative like me and want to do all the things, plus you work full-time, have a family and friends, oh and you love to travel and explore new areas every weekend, and not to mention you’re trying to put your mental health first? Balance just isn’t the right word. For me the key to juggling all the things is two-fold: Planning and saying no. I keep a weekly and monthly goal list, along with planning out when I am going to do what. Belly dancing class is always on Saturday mornings, therapy is always on Wednesday evenings. Sunday nights are for making art, while my daily commute to work is for reading. I keep track of all the projects I am working on and prioritize what I want to work on. If I don’t finish it that month or week, I move it to the next week. Sometimes I realize I just don’t have interest in that project anymore, so I take it off. 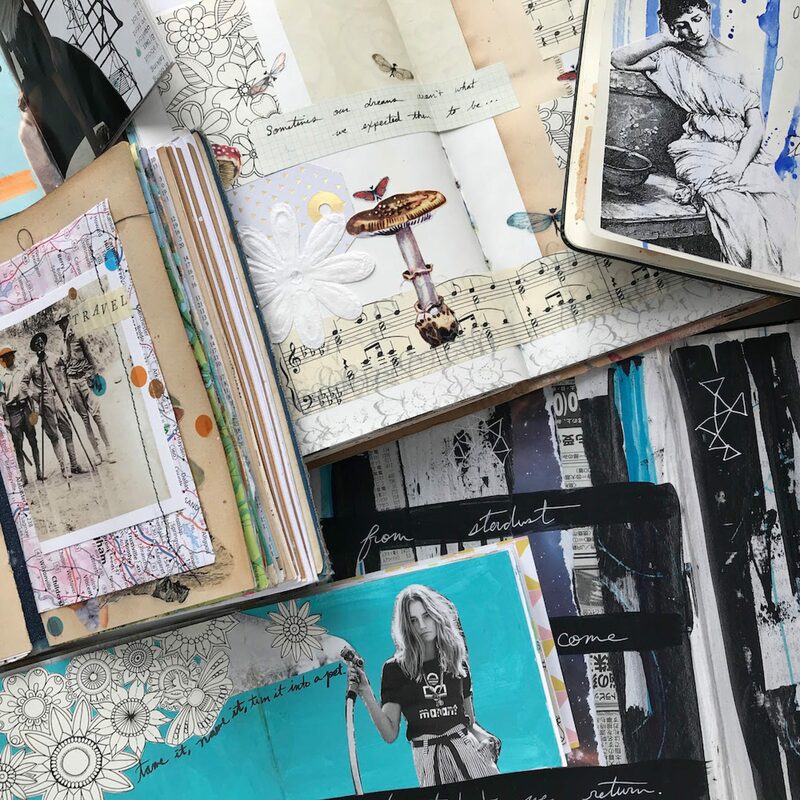 For example, every month I work on my Rituals journal, while every day (or more realistically, every few days), I work in my daily journal series called #Mydayarted. The second key to making all things work is saying no so I have time to work on the things that matter to me. It means saying no to a movie night with friends so I can work on my art for a few hours after work. It also means taking a break from art or writing to go to the movies every once in a while- after all, being an artist doesn’t mean you have to be a hermit as well. When you’re in pursuit of all the things, be careful of burn out. Your health matters, including physical and mental health. If you can’t take care of you, you won’t be able to take care of anyone else, let alone pursue your creative goals. Listen to your body and if you need a break, take it. Don’t think that you have to work 24/7 to prove yourself. You don’t. I have a full-time job in financial journalism and a part-time career as an artist. I love both my job and my creative pursuits. Sometimes I need to take a break from art if things are busy during work (hello, earnings season!). Sometimes it takes me forever to create an Etsy shop (yes, still working on that). And sometimes it means only having five minutes to cut out a flower for a collage (this morning). Lastely, stop comparing yourself to others! And yes, we all do it. I do it all the time. But it’s counterproductive, because guess what? We are all doing the best we can. And that best looks different to different people. I can also guarantee that artist who is always has shows or that writer who just published a book also struggles with her own worries about the bills, her weight, whether or not she should stay up to watch one more Netflix show. We are all trying to find balance in the topsy-turvy life we lead and that itself is enough. So invest in a planner you love, prioritize what is important to you, and never forget to take a break when you need it.